While this golfing institution has hosted more than 1.5 million golfers over the years, including Mayor Hazel McCallion’s gala charity event for 18 years, the golfing public experienced and applauded a surprisingly new and exciting Derrydale in 2010. 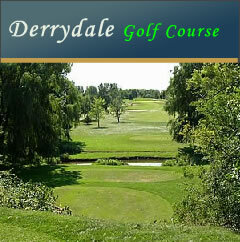 Derrydale is the first golf course west of Toronto to offer the public a 12-hole round of golf. In providing a 12-hole test of golf, Derrydale is the perfect alternative for golfers who feel that 18 holes is too expensive and time consuming while 9 holes doesn’t quite seem to satisfy their golfing appetite. Derrydale’s unique layout is a par 40 test. The novice player will find the new layout to be challenging yet forgiving. The experienced player will also like the re-vamped year old design. He or she will get to play every club in their bag and will need to play well to score well. Water is in play on eight of the 12 holes. There are 26 sand bunkers and the mature course is lined with many maples, pine trees and weeping willows. - Limited memberships with most tee times available to the public. Tee times can be booked up to seven days in advance. - A casual breakfast, lunch and dinner menu with a fully licensed clubhouse from 11 a.m. to close daily. - A family-run operation that provides a friendly environment and services. - Corporate or fundraising tournaments with casual fare or full-course chicken or steak dinners for up to 60 people. Events can be booked well in advance. - Conveniently located near the Mississauga/Brampton border with easy access from Toronto via Highways 401, 410, 403 and the 407 ETR. - On-course beverage and snack cart, weather permitting. - Golf lessons by teaching professional Dave Nelson. - Twilight special rates, usually starting 3 hours before dusk, as well as special rates for Seniors aged 60 and up, as well as Juniors up to age 17. - A practice green and chipping area. - Both power carts and pull carts. - A fully stocked pro shop. At Derrydale, people now get more golf for less money than ever before.